The Twin Towers Hotel, Bangkok is an International 4-star hotel in Bangkok located in the center of Bangkok where most shopping centers are situated. The Twin Towers Hotel's location provides an easy access to business areas, sight seeing places, Mah Boon Krong shopping center, Siam Paragon, Siam Center, Siam Discovery and Central World Plaza. Experience the warm comfort and rich Thai culture at The Twin Towers Hotel, all 660 spacious rooms offer an experience of comfort and tranquities. The hotel provides superior recreational and leisure facilities, including a sauna, outdiir pool, fitness center, massage & spa, hair dresses salon, tour & travel desk, covered parking, lounge and a number of restaurants. Our specious guest rooms feature large comfortable beds to provide maximum comfort and convenience. Each room has an individual air-conditioning, Wi-Fi high speed internet, mini bar, 24-hour room services, hairdryer and complimentary toiletries. All suites stylishly decorated and furnished with all amenities, in-room safety box and living room to ensure every guest an enjoyable stay. Ebergize yourself with an invigorating workout at the Twin Towers Health Club, tranquil your muscle in our warm and cool jJacuzzi. With skilled spa therapists well versed in the find art of massage, the Boran Massage & Spa is the ideal place to shed the cares of the world and enter into a realm of blissful relaxation. Find out more facilities between the two towers, splashing into an outdoor swimming pool with private Jacuzzi as well as a hairdresser salon. 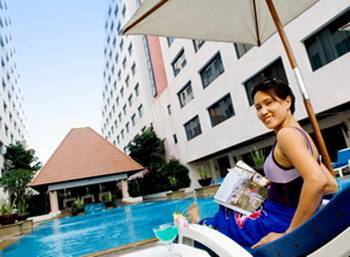 Whether business or leisure brings your clients to Bangkok, make sure you book them into a hotel that provides true value for money. At The Twin Towers they can look forward to graceful service, surprisingly spacious guestrooms. 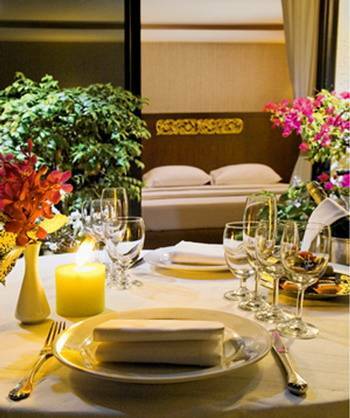 a choice of six restaurants and bars, superb cenference and business support facilities. In fact, everything they would expect of Bangkok's finest hotels - except the price. The Twin Towers - it's the sensible choice. Inclusive of International Buffet Breakfast, service charge, tax. In case of cancellation, a written notice must be received by the hotel at least 48 hour prior to guest's scheduled arrival. In the event that this written notice is not received within the time limit stated, and in the event that there is no show from the guest, the contract rate will be charged as NO SHOW. 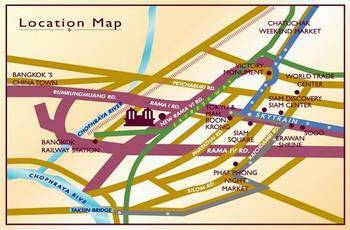 Ideally Situated in the heart of the city's growing commercial district on Rama 6 Road. Nearest airport: Suvarnabhumi or Dong Muang 32 KM.